Bearded seals can weigh as much as 800 pounds. Bearded seals are one of four arctic seal species, in Alaskan waters, that rely on sea ice for feeding, resting, and pupping; these four species are collectively called ‘ice seals.’ Bearded seals are the largest of all arctic seals and are distributed in the Bering, Chukchi, and Beaufort seas in Alaska; their overall distribution is circumpolar. They have a small head in proportion to their body, long whiskers, and square-shaped foreflippers. Adults can grow to 7–8 feet (2.0–2.5 m) in length, from the nose to the tip of the tail, and weigh 575–800 pounds (260–360 kg), with females weighing slightly more than males. 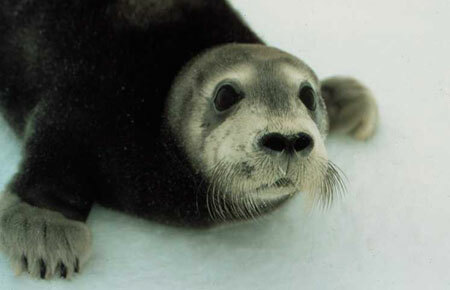 Bearded seals weigh the most in the winter and early spring when they have a thick layer of blubber under their skin. The blubber serves as insulation and as an energy source during the breeding and pupping season. Bearded seals lose weight during the reproductive and molting seasons when they do not forage much. Coloration of adults range from silver-gray to dark brown and they have no distinctive markings. Bearded seals typically have 34 small teeth that they wear down quickly such that seals older than 9 years rarely have teeth that extend above the gum line and so they appear toothless. Bearded seals’ life span can exceed 25 years. Bearded seals are food for polar bears, killer whales, coastal Alaska Natives, and possibly some walruses. Females are capable of having one pup every year, but may pup less often depending upon food availability. Pupping, suckling, and mating occur on the seasonal sea ice within a period of a few months. Females give birth to a single pup on top of the ice in late April or early May. Bearded seal pups are born with a soft grayish-brown natal coat called lanugo that insulates them until they can build fat reserves. Lanugo is shed about one month after birth when the adult pelage is grown. Pups rapidly increase their weight to around 190 pounds (86 kg) during a nursing period that may last one month. Most of the weight gained is blubber. Females nurse pups for about one month before weaning takes place during ice breakup. Most bearded seals breed in late May or early June just after weaning their pups. The active gestation period for bearded seals is only 8.5 months, but a 2.5 month delay in the implantation of the fertilized embryo corrects the timing so that the pups are born the next spring. Female bearded seals begin to reproduce at 5–6 years of age and males become sexually mature at 6–7 years of age. Bearded seals primarily feed benthically (i.e., near the sea floor), usually in water less than 650 feet (200 m). In Alaska waters, they eat a variety of benthic invertebrates (crab, shrimp, clams, and snails), bottom fish (sculpins and flatfish), and some pelagic fish (cod). Bearded seals can create breathing holes in shorefast sea ice with their claws but do not tend to maintain them through the winter like ringed seals do. Bearded seals are usually solitary animals, except mother-pup pairs, which can be very wary of their surroundings. They rest close to a hole or crack in the sea ice so that a quick escape from predators is possible. Bearded seals “bask” on the sea ice in May and June to increase their skin temperature in order to facilitate molting. During the molt they are less wary of boats and humans. Bearded seals have good vision and hearing and a moderate sense of smell. It is common for a bearded seal to surface in the vicinity of a boat, dive then resurface a safe distance away. Male bearded seals vocalize during the spring breeding season using four types of calls: trills, ascents, sweeps, and moans. Each male’s vocalizations are unique and they return to a specific breeding territory each year for mating. Scars on the males indicate that fighting may be involved in defending territories as well. Eskimo hunters follow the sound of singing bearded seals to hunt them. Bearded seals occur in association with sea ice and individuals generally move south as the pack ice advances into the Bering Sea in winter and north as the ice edge recedes into the Chukchi and Beaufort seas in the late spring and summer. However, some bearded seals stay near the edge of shorefast ice all winter and do not migrate south. Leads, polynyas, and other openings in the sea ice are important features of bearded seal habitat. Juvenile bearded seals tend to associate with sea ice less than adults and are often found in ice free areas such as bays and estuaries. The distribution of bearded seals appears to be strongly associated with shallow water and high biomass of the benthic prey they feed on. They are limited to feeding depths of less than 150–200m. 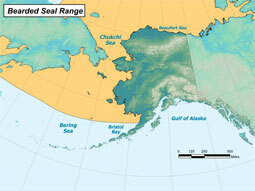 There are no reliable population estimates available for bearded seals in Alaskan waters. Population estimates are extremely difficult to attain for ice seals due to the remoteness of their habitats and no estimate has been corrected for the number of seals that were under the ice during the survey. The population in the Bering and Chukchi seas was estimated from aerial surveys in the 1970s at 250,000–300,000. Because there are no reliable population estimates there is also no trend information. Because of their dependence on sea ice, there is concern that climate change may negatively affect bearded seals and their habitat. Changes in sea ice thickness, coverage, formation timing, and duration of coverage due to climate change may substantially alter benthic prey availability and the quality and amount of sea ice necessary for feeding, resting, molting, and pupping. Activities associated with offshore oil exploration and recovery could affect bearded seal distribution and the benthic invertebrate prey they feed on. However, the effects of direct contact with oil and industrial disturbances on bearded seals have not been studied. Bering, Chukchi, and Beaufort seas in Alaska and circumpolar.